I completely forgot to update about this last Sunday! I'm entering week 4 of the 4 week challenge and here's the rundown. 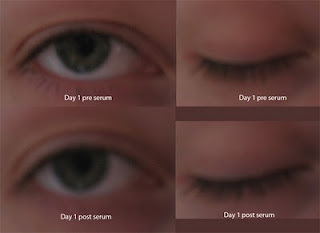 As you can see...no change whatsoever from this serum stuff. The biggest changes I can see in my lashes come from my trusty eyelash curler, and the two-step mascara. The two-step mascara consists of a white lash extender and a black mascara. 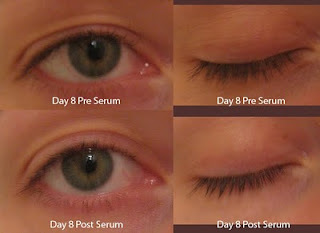 I'll continue the 4 week lash boosting serum challenge through next week to give it the full chance, but I really doubt I'm going to see any difference whatsoever. I'm also mystified as to why it needs to be used at all, since tonight I noticed that the mascara tube has the lash boosting serum listed as included. Why the extra product then, L'Oreal? I still like the mascara quite a bit. In addition to actually working, it stays put all day long without running all over my face, doesn't make my eyes water at the end of a long day, and yet still washes off effortlessly with water and cleanser. I don't have to scrub at my eyelashes to get them clean, and I'm not left with raccoon eyes either. I rarely have to swipe underneath them with a q-tip the way I had to do with my previous mascara. good luck with your challenge! I also don't see any changes yet and I think your lashes look just fine.